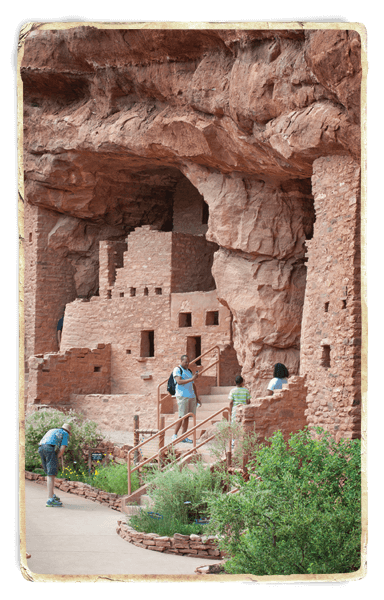 The Anasazi built large, multi-story stone structures with hundreds of rooms to house the new communities on open ground. In the second major Anasazi cultural period, beginning around A.D. 750, they are called the Pueblo Anasazi. They began to settle down, rely even more on agriculture, and stay in one place much longer. They gathered together in larger and larger communities. Before and during this phase there were many developments — mostly gradual or evolutionary — that dramatically changed their culture. They began using the bow and arrow, which was much more accurate and effective than the spear and atlatl (throwing stick) they’d used previously. To their domestic crops they added beans — including common, kidney and navy beans. During their nomadic wanderings they needed baskets for their lightness and mobility. As they settled down, they used more pottery for food storage and cooking. Their pottery making developed into what we consider an art form. Their pit houses, which had become deeper and more permanent, began to give way to a new kind of construction, above-ground structures. They started building with stone. Eventually, more families came together as clans, and clans formed tribes. Hamlets grew to villages, then towns. Larger numbers of people participated in religious and spiritual ceremonies. The round or keyhole-shaped underground kiva grew in size, importance and permanence. Usually, it was built in a central plaza. The Anasazi built large, multi-story stone structures with hundreds of rooms to house the new communities on open ground. Yellow Jacket, near Cortez, Colorado, is the largest prehistoric town yet discovered in the Southwest. It had 1,800 rooms and housed nearly 3,000 people. Later, perhaps in response to enemy threats, the Ancient Ones began building the awe-inspiring stone structures, which we call cliff dwellings, perched on rock ledges above a canyon bottom.